The setting begins in Minneapolis and then moves between LA, Minneapolis, as well as some scenes set in Florida. Agent Stan Bauer has been murdered and believed to have been a Mafia hit. Detective Maria Sanchez is on the case. Her partner is Tom Powders who is nearing retirement and he has been acting very odd lately, Maria is not sure what he is up too, but begins to speculate as the story continues. They believe there is a leak in the department and no one can be trusted. Special Investigator Joe Morgan is Maria’s husband of ten wonderful years. Chief Sandra LaSalle is the new chief having moved from New York only a year ago, she is a petite redhead in her fifties and is not very well liked and has earned some names since arriving as the new Chief in Minneapolis. Due to the nature of the crimes being committed, the possibility of a leak within the department LaSalle has made the decision to assign the case to Sanchez and partners her with Morgan. Maria was once married to Jack Sanchez known as The River Rat and was the father to her daughter Tess. He was also father to a boy named Tony, whose mother died and Maria and Joe adopted him, after all he and Tess are brother and sister. Tess is in college and is twenty years old, Tony is a teenager about sixteen. It is nearly Christmas and Tess has finished with finals and comes home to stay for a month, which is just in time as the case heats up for her parents. Will they finally be able to put an end to all the mafia’s crimes? Will anyone else die as a result of this investigation? Will the person responsible for leaking the information to Marco be discovered in time? LaSalle brings in Etina Altmark a Russian from New York to go undercover as a runaway, she is twenty eight but looks as if she is only fifteen. Hyytinen has a way of leaving you on the edge of your seat, she has incorporated vivid details and accounts throughout the story, making this one that you have to read from front to back non-stop. The chapters are short and each chapter leaves an inevitable hook at the end leaving you with the desire to read one more and then another. The author has superbly written scenes with impact, with a steady flow of action and suspense. This story is so relentless, gripping and intriguing and a genuine page turner. The characters are so finely tuned, believable and real, you find yourself cheering them on, hoping for the best, and feel these are people you have known for quite some time. You will find yourself thinking of the characters long after finishing the book. The story erupts with explosive twists and delivers a powerful ending that will leave you breathless. This is a must read, I will warn there is mature themes including language, but I have no hesitation in saying I highly recommend reading The Maria Sanchez Thrillers. If looking for an explosive read you will not want to miss this one. 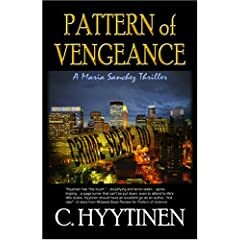 It has been a great pleasure to read and review Pattern of Vengeance and I truly cannot wait to read the first in the Maria Sanchez Thrillers, and look forward to all her new releases.